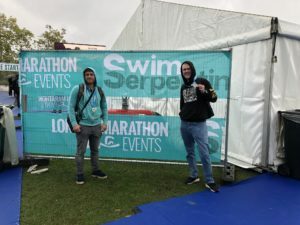 If you follow me on Youtube or Instagram you’ll know I’m a runner, not a swimmer, so why on earth have I taken on The Serpentine Swim? There’s only one reason and that’s to complete the London Classics. Not heard of it? Read on……. The London Classics requires you to complete the London Marathon , The Ride 100 London, and the Serpentine Swim. 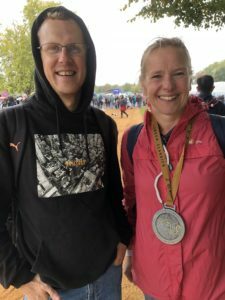 You don’t have to do it all in one year, just do them at some point and you’ll get the London Classics Medal at the finish of your third event. When I saw this challenge it peaked my interest immediately, I’m such a bling magpie that the prospect of a massive shiny medal was too much to resist. The trouble is I don’t cycle and I don’t swim so I hadn’t the first idea what to do. Luckily the lads that I’ve done the Cotswold 24 Hour Relay with “Team Thunder” are stacked with Ironman finishers who know a thing or two about both disciplines. I’ve done the London Marathon & balloted for the Ride 100 a few times but haven’t got in. My plan was to wait until I’d been successful, completed the ride, and only worry about this swim if I really had to, as the last thing to tick off. Then I noticed you could just pay and enter the swim with no ballot. 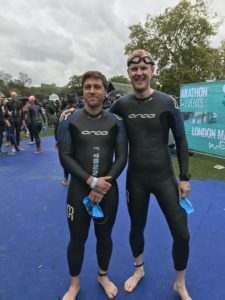 I figured over time more and more people will want to do the London Classics, so the Swim will only increase in popularity and could eventually be a ballot too. 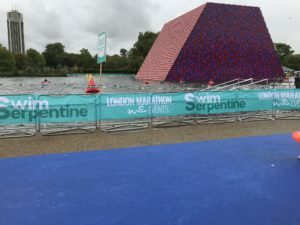 So that was it, I decided to enter the Swim Serpentine, get ahead of the game and tick it off. What follows is probably the way not to do it! 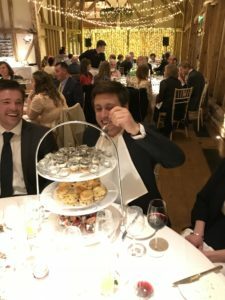 It was at Will’s wedding in March when Colin and I were on the same table, not only did Colin think it was a good plan to try and eat the entire tables deserts, but after a few beers we spoke about doing the Swim Serpentine together. All of our wives were at the table, the more they told us it was a bad plan, the more we didn’t listen and before you knew it, we were adamant to go ahead. Within the next couple of weeks we both signed up. 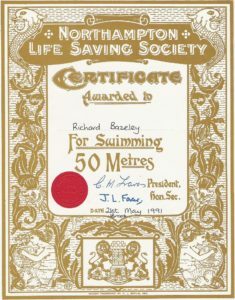 I started out all keen to train for this and Colin took me to the local pool a few times trying to teach me to front crawl properly. This is where I should probably tell you how bad I am at swimming. Back in the day at school when you were awarded massive badges to sew onto tiny trunks I never ran out of trunk space and I never got more than a 50m badge. I’ve never bothered to become a stronger swimmer in adulthood either it’s just never floated my boat. I can’t front crawl properly with a proper head turning and breathing rhythm, and at the risk of rocketing to the top of a pervert watch list, I’ll admit that I’m a breast stroke man. Colin tried his best but to be honest I went to the pool maybe 3-4 times and did no decent amount of training. I was banking on a few things, 1) I have a good cardio base as an endurance runner 2) I have a lot of mental discipline to press on when the going get’s tough like at The Comrades Marathon 3) I never quit. I felt that these qualities would be enough. I did no more swim training and I didn’t even visit a lake, let alone enter one. Just last week I was a the English Half Marathon and on Saturday I was chilling at the race hotel pool with Delroy and Michele with no real plans to swim. It occurred to me that I had a week left and hadn’t trained, and had a perfectly good pool right there so I swam a mile. I felt like I hadn’t revised for an exam and was cramming in some last minute study that was unlikely to make a difference at this stage, but that mile felt OK and I felt confident I could do another if push came to shove. The next issue was that I don’t own a wet suit! I put out the assistance shout to Will and being the legend he is he loaned me his Orca Wet Suit which I only picked up 2 days before the swim. I thought Will was also a good man to ask for tips because he’s an Ironman. 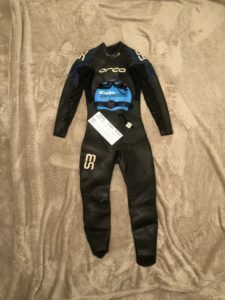 He said to me sometimes people pee in their wet suit to keep warm, but then gave a stern warning “DON’T DO THAT IN MY WET SUIT” that was me told lol. 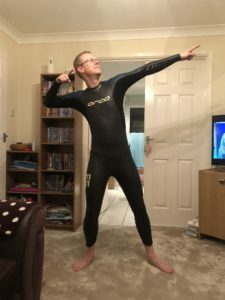 I got home with no idea how to put on a wet suit and despite both me and my wife going at it, it took half an hour to get the thing on but finally we managed. Will also said that I’d need to wear some speedos under the wet suit. This was news to me and I didn’t own any. The last time I had tightly fitting underwear with good undercarriage support was after quite a delicate procedure but having fully recovered I’d got rid of all those. On Saturday morning, the day of the swim I got to Sports Direct for opening time to get some speedos. When I got there they had trunks but they were made by Slazenger? This is not a brand that automatically makes me think of swimming and I’d usually associate it with tennis, at least I could get a pair of decent balls to go with them! We set off and got down there within good time. At London Marylebone I bought a Tuna & Sweetcorn sandwich in the hope I’d gain tuna like swimming skills, & we all know sweetcorn floats right? On arrival we had time to look around Hyde Park and find the Serpentine. We could see swimmers in the water from earlier 500m or one mile waves but I also found some signage that filled me with confidence. 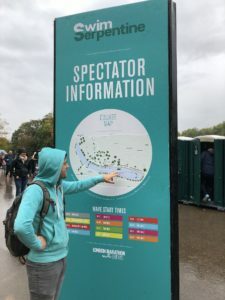 But joking aside there was some really good signage directing you from the tube to the race, and we used Hyde Park corner which was only a short walk. I saw a massive statue that I’d seen in 2003 when I saw the Red Hot Chili Peppers live which was a great flashback memory. Given it was raining and I was about to swim in a cold lake a few Red Hot Chilis wouldn’t have gone amiss. There were big changing tents and both Colin and I got changed into our wet suits. I’d put my budgie smugglers on before going so I didn’t need to expose myself. I figured I’d save that for after when I’d been swimming in a cold lake and had an excuse 🙂 The practice run at getting the wet suit on at home came up trumps though as I managed it quite well this time having learned a few lessons from YouTube videos. We were all set to go and although I’m smiling for the camera I was bricking it! It was really dawning on me that I’d never swam in open water, all the comedy in the world wasn’t going to save me here I had to work hard to do this. There was a dunk zone where you could get in the water and acclimatise and initially I thought if I did that, then got out I might not want to get back in so wasn’t going to use it, but Colin’s advice was to do it, let water into the suit and get used to it so I took the voice of experience and dunked. I’m so glad I did because the cold water was shocking, and I had to ease into. I think if I just got in and tried to go straight away I’d have struggled to swim whilst adjusting to the temperature. On the start line there was a safety briefing and it was explained to keep the red buoys on your left and the yellow ones on your right. When you saw purple you were at the end of the lake and to turn right around 4 purple ones. It was a 2 lap course, no leg pulling, no dunking and no heavy petting. After a short warm up the blue swimming hat wave and I were setting off to the fitting song FINAL COUNTDOWN. I started swimming and what hit me was that the water smelled bad, tasted bad, and within a minute the goggles had fogged up. I could barely see, the wet suit made me feel claustrophobic and so many better swimmers were whizzing past, clipping my legs as they passed, clipping my arms and I started to freak out a bit. The first 15 minutes were pretty weird and I was massively out of my comfort zone. Luckily the faster ones got ahead and it got less crowded, my eyes adjusted to the fogged up lenses and I got into a rhythm, and just got on with swimming, albeit quite slowly. I took me just over an hour to complete the first lap and it was only really towards the end of this lap that the fog on the lenses started to subside. As I got to end of lap 1, I’d been lapped by most of the blue hats already and I could see them all moving left to finish. Now I would never cut a course or cheat in an event, but honestly I looked at them all finishing, I was already tired, already cold, I was getting hungry, I needed a wee and bloody Will wouldn’t let me. There was a huge temptation to just cruise in to the finish line and quit. 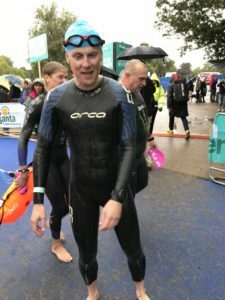 If I had done then I would have declared myself as a DNF, and as I swam towards the fork in the water of the finish or lap 2 I had some serious deliberation over what to do. I considered that I was only getting slower and more fatigued, my stroke rate would drop, I’d generate less body heat, would it be safe to continue, I very nearly quit. I needed to focus on something to keep me going, the London Classics medal was a huge motivator and I also had done half the work so why wait a year to go back to square one. Then, the music at start/finish area, on the most perfect playlist dropped TAKE THAT’S cover version of Let’s Go Round Again. I started singing it in my head and before I knew it I was going right to lap 2. As I started lap 2 the pink hats were setting off in their wave so it got busy again but I wasn’t so freaked out this time. The second lap was so hard, it was so slow and I just did what I could to keep going. My neck was hurting as I’m not used to holding my head in the position I was so a few times I turned onto my back to alleviate this. By the time I was getting to the end pink hats on their second lap were going past and the finish line seemed to take forever to come. When I got there volunteers were at the ready to help pull you out the water. They pulled me onto the ramp to get out and I was on my hands and knees. The first priority was to stop the Garmin, then I tried to get up. I can’t explain what happened but essentially my legs just would not work I couldn’t stand up. I was worried that swimmers behind me were coming in thick and fast and I had to get out the way so I crawled. I was obviously struggling and two lads volunteering came to my aid and got me to my feet, and they walked me away. After about 20-30 paces the muscles kicked in and I was fine but that 60 seconds after finishing was completely weird and I’d never experienced this before. I’ve done a 3:03 marathon and managed to walk fine so I can only assume this is something to do with working different muscle groups that I haven’t trained. I felt destroyed and this next photo shows that I look it too. I picked up my medal, Peanut Butter & Dark Chocolate Kind Bar, Bottle of water and Swim Serpentine swim bag. I completely ignored the hot tubs and just got my bag, got dry, dressed and warm as quickly as possible. I ate the Kind Bar quickly and Colin gave me his too. Colin’s wife Emily had already bought me a hot drink and a box of chips to warm up and refuel which was a god send. With medals on necks, it was still raining and we got out of there. Loads of finishers were receiving their London Classics Medals and seeing them really inspired me to keep working towards mine. 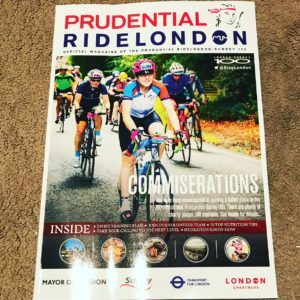 I’m now two thirds of the way to the London Classics Medal and I’m in the ballot for the Ride 100 for 2019. Fingers crossed I get in. 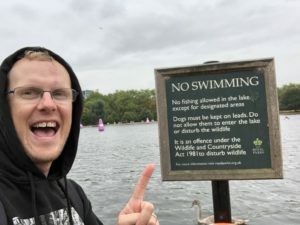 So can you take on a 2 mile open water swim with no experience and no training, having never actually swam in open water? Well apparently yes, but I’d caution against it. I’m lucky my running background fitness dragged me through and it wasn’t pretty. 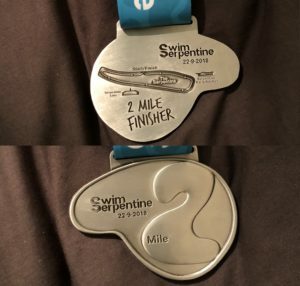 If you do it, please prepare better than I did, I massively underestimated this challenge, swimming is pretty hard and kudos to all open water swimmers. 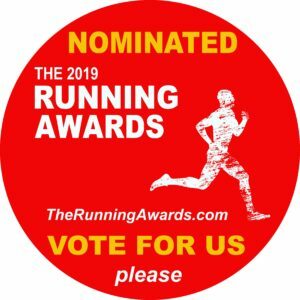 I’m also currently nominated for best blog at the Running Awards. If you’ve enjoyed this blog, your free vote for baze187 will really help support me & my blog, just click this massive red button. N.B. This blog contains affiliate links. If you make a purchase using one, at no additional cost to you a small commission is paid to me which goes to support the production of this blog which is free to you the reader.